Volkswagen singed a memorandum of understanding today regarding its investment plan in Ethiopia which is expected to be the biggest expansion center in Africa. 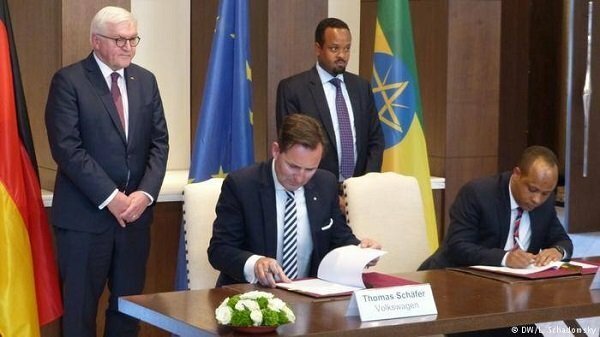 Abebe Abebayehu, Ethiopian Investment Commission Commissioner, and Thomas Schäfer, Managing Director of Volkswagen for Sub-Sahara Africa, singed the agreement. Visiting German President Frank-Walter Steinmeier was present during the signing in ceremony. According to a report by Ethiopian News Agency (ENA), the company is interested in Ethiopia as an ideal place for Volkswagen expansion in Sub Sahara Africa. Ethiopian government expressed commitment to provide a favourable investment environment in the country. It is to be recalled that executives of the company visited Ethiopia in October 2018 and met with Prime Minister Abiy Ahmed.